The Museum is nearing the completion of the two-year National Endowment for the Humanities grant-funded project “Conserving, Digitizing, and Creating Access to the J. Clarence Davies Collection of Art.” Begun in 2011, this project encompassed 1,578 paintings, drawings, maps, and prints documenting the history of the city of New York from the 17th through the 20th century. unknown photographer. 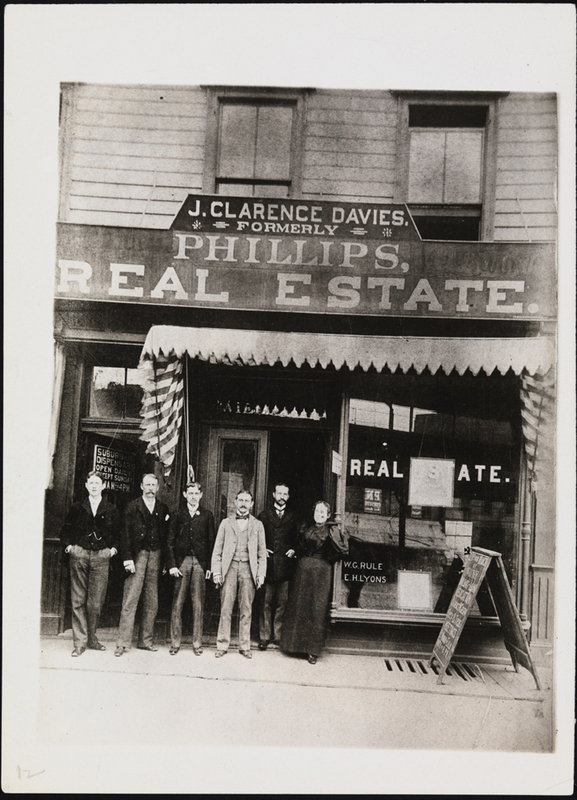 J. Clarence Davies Real Estate Office, ca.1894. Museum of the City of New York, X2010.11.7075. J. Clarence Davies (1868-1934) was a leading New York real estate businessman who primary dealt in Bronx properties, earning him the nickname “the King of the Bronx” from his colleagues. (He’s pictured in front of his office, last man on the right, in the photo to the left). He was a civic leader who served on many public and charitable committees, and was also one of the foremost collectors of visual records of New York City’s past. His donation of New Yorkiana to the Museum in 1929 reflects all five boroughs, and included not only maps, prints, paintings, and drawings, but also textiles, ceramics and other types of objects–as long as they depicted the city in some way. Davies was such an avid collector that he occasionally acquired works for his collection regardless of their condition. It is also clear from notes on many of the objects, and is evidenced by wear and tear, that Davies used at least portions of his map collection as a working reference collection, and consulted it regularly for his real estate business. Both of these factors, along with the objects’ ages, led to the need to conserve particular objects within the J. Clarence Davies Collection. From my perspective, as the archivist who cares for the Museum’s map collection, one of the most exciting aspects of this project was the conservation element. 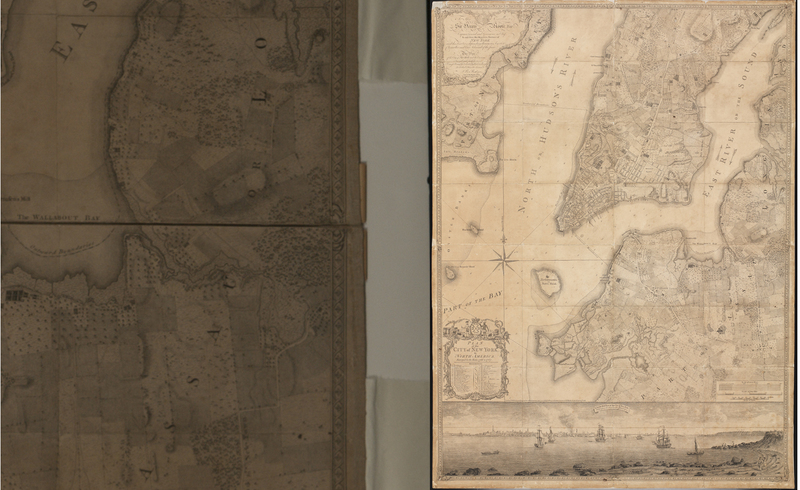 In order to decide what maps would be good candidates for conservation, we evaluated items in terms of both their condition, and their significance to New York City and the Museum’s collection. Once candidates for conservation were identified, the Museum worked with the Northeast Document Conservation Center to obtain treatment estimates. Walter Newman, former Director of Paper Conservation at the NEDCC, made three trips to the Museum over the course of the project to evaluate works onsite. As you can see in the “before treatment” photos, above, the map had been folded up in the past and sections that were exposed when folded were particularly soiled and discolored. The paper was brittle and there was extensive breaking and some loss along the folds and at the edges. There were several pieces of paper tape on the reverse. There were a few dark brown stains and scattered finger marks. One section on the reverse was also marked by liquid stains and insect specks. The image below shows the map after conservation. This map is especially significant as it depicts sections of the Bronx which were previously considered part of Westchester, prior to the consolidation of New York City in 1898. As evidenced from small staple holes in the map, it was originally mounted on dowels at the top and bottom and rolled around the dowels when not in use, accounting for the rippled texture of the map in the “before” shot to the left. Additionally, at the time Davies acquired this map, it would have been common practice to back rolled maps on fabric and shellac the front to protect the surface. Over time the shellac darkens and cracks, and the ancient acidic fabric breaks down; as a result, the very materials that were intended to extend the life of the map contributed to its ultimate deterioration. Bird’s Eye View of that Portion of the 23rd and 24th Wards of the City of New York, lying west of the N.Y. and Harlem Railroad, and of the Grand Boulevard & Concourse. Surveyed by Louise A. Risse, 1897 (Before and after treatment). Museum of the City of New York. 29.100.2612B. The map above, picturing the Bronx as well as a portion of northern Manhattan, also shows evidence of brittle paper and breaking along creases caused by rolling. 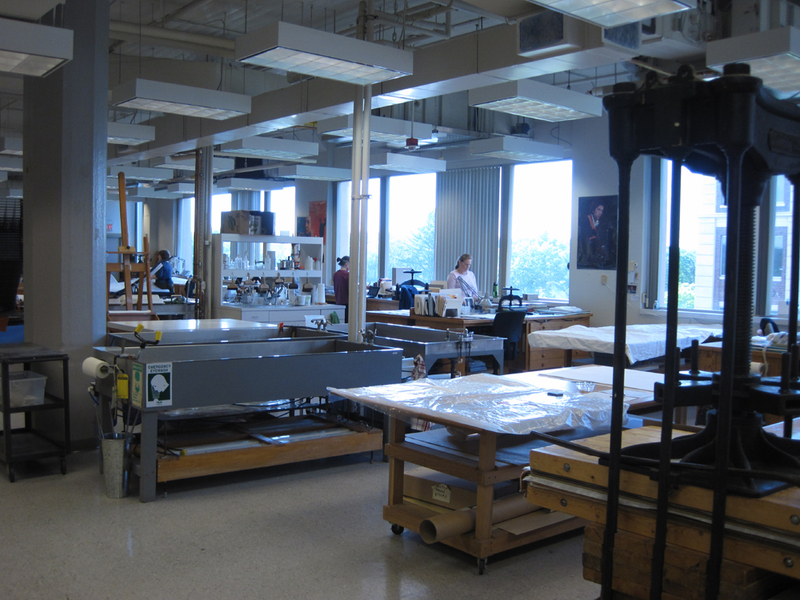 Northeast Document Conservation Center lab. Andover, Massachusetts, 2012. 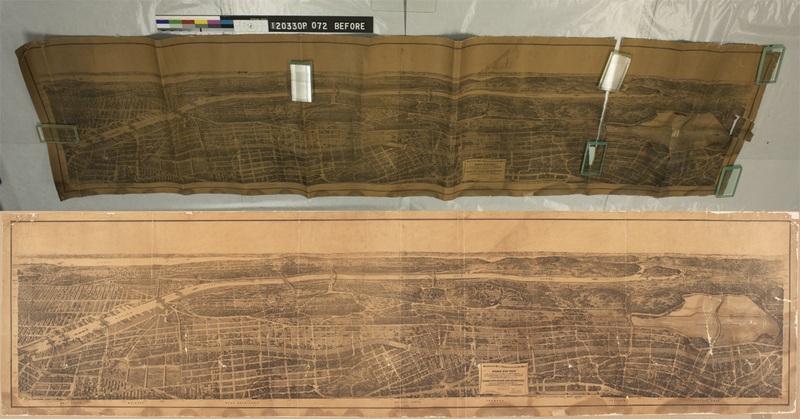 The two maps above were unrolled to be examined onsite at the Museum; Mr. Newman, however, recommended they not be unrolled again until the objects reached the NEDCC’s lab. While this project was underway, I had the opportunity to visit the lab, see the NEDCC team at work, and learn all about the various techniques they use to conserve paper objects. A few of the many conservation treatment techniques used over the course of the project included: reduction of surface soil using dry cleaning techniques; humidification of objects were and blotter-washing with filtered water to clean the paper and reduce acidity (after determining the media wasn’t water soluble); removing old paper mends before washing with a wheat starch paste poultice (recommended for removing adhesives from paper); backing objects with thin Japanese paper and wheat starch paste to mend tears and fill losses; adding additional strips of heavier weight Japanese paper using wheat starch paste to further support breaks and provide overall supports; and a final humidification of objects and flat drying between blotters under pressure. One of the highlights of this project was the discovery of the map below, Plan of the City of New York, In North America: Surveyed in the Years 1766 & 1767, surveyed by Bernard Ratzer, and published by Jefferys & Faden, London, 1776, at the Museum’s offsite storage facility. This map is considered one of the finest depictions of pre-Revolutionary New York City. While documentation in the Museum’s collections management system had indicated that the Museum held several later reprints, the discovery of an original printing of an early edition of the map was an exciting surprise. After visiting Brooklyn Historical Society, to examine their “first state” Ratzer (published 1770), it was determined that the Museum’s copy is likely a “second state” – not as rare, but still quite a find. Aside from the fact the map had at one time been cut into several sections to facilitate storage (it’s 48 3/4″ high x 35 3/4″ wide), it did not appear to be significantly deteriorated, considering it is over 225 years old; it had been backed, however, on a heavy fabric somewhat resembling burlap, which necessitated immediate removal. As a result of conservation, the seams between the sections are hardly visible, significant surface soil has been removed, and the map is now backed on Japanese paper rather than coarse, acidic cloth. Davies once stated he “had treasured his collection for many years in the hope that he might someday be able to place it where future generations could study with its aid the history of the city.” The Museum considered Davies’s collection so important that a copy of the deed of gift was among the documents placed inside the cornerstone when construction began in May 1929 on the present, landmarked building on Fifth Avenue. Click here to view more selections from the J. Clarence Davies Collection. The Museum of the City of New York gratefully acknowledges the National Endowment for the Humanities for their support on this project. This entry was posted on July 30, 2013 by Lindsay Turley in Maps and tagged 1700s, 1800s, 1900s, Bernard Ratzer, Bronx, conservation, J. Clarence Davies, M. (Matthew) Dripps, maps, National Endowment for the Humanities, Northeast Document Conservation Center, Phillip Hone.